"Every day is a precious day. The way we looked at it, the man upstairs needed a pitcher and a shortstop." I wanted to find out more about the young man he’d become before his death, and spoke with two men who knew him well. Mark Gambardella and Lance Ligon coach the Dom Aitro Baseball League in New Haven. They first met Jericho Scott years ago when his older brother was playing on Gambardella’s team. Mark Gambardella: And this little peanut came along with his brother, and at that time, Jericho was six years old. He wanted to play. So we had him practice with us, and even at the end of the season, I had to give Jericho a trophy just to shut him up, basically, 'cause he was ...oh God, how do I say this? Gambardella: Yeah he was a pain, all right. A little more than that. He’s pretty much been with Dom Aitro since he’s been six years old. WNPR's Diane Orson: And he was a talented baseball player? 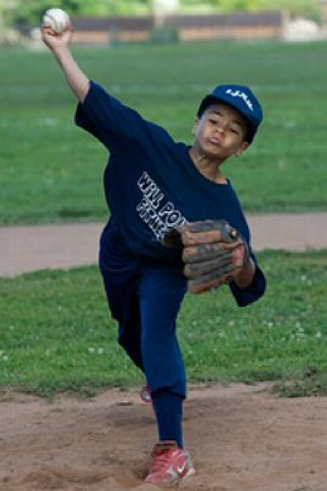 Jericho Scott pitching at ten years old. Gambardella: Yeah, he was very, very talented. You could tell right from that age. I didn’t want to put him on the field against ten-year-olds at that point, but the following season, we did. And as he grew and developed -- eight, nine years old -- he had a very good arm. His accuracy of throwing the ball pitching was tremendous. He was a good short stop, he was a good center field. Tell me a little bit about what he was like. Gambardella: Yeah, it's tough. I know, it's tough. Ligon: That Saturday, about 5:30, he called me, and wanted to know when we was going to practice again. And I told him. He said, “Coach, I called you about another kid.” And he did his best to convince me about taking on this other kid. I told him that we would discuss it. He just kept on, kept on, kept on, and he wanted to look out for this other young man. He was a good kid. He was a typical good kid. He was a pain. I tell anybody that he was a pain. What was he a pain about? Ligon: He would nag you to death 'til he got what he wanted, just about. "Coach, let me pitch." No, you’re not pitching today. "Coach, let me pitch. Why you not letting me pitch?" Gambardella: He was an honor student in school. I mean, even in the dugout, as much as he would fool around, when it came time to start the game, he was all business. "Okay guys, let's go. Let’s show them who we are. Let’s show them where we’re from." Last year, we played up in North Carolina. And the team -- for being an inner city team -- we went through two teams from North Carolina. We beat 'em. A team from Maryland: beat 'em. We ran up a juggernaut from Virginia where each child pays $7,000 to play for the team. Talk with me about what a baseball team like this means for kids like Jericho. Gambardella: It gives them an opportunity to prove to themselves, and prove to others that they are just as good as a team from Fairfield, a team of Virginia..
Ligon: Mark and I have a very strict policy. Mess up in school? You messed up with us. You mess up at home, you messed up with us. We tell the kids that they can call us 24 hours a day, seven days a week if they have a problem. Doesn’t matter what the problem is about. You can call us. We went through the state and the tournament undefeated. We went through Mass, Northeast, undefeated. Gambardella: Teams from New York, Massachusetts, Rhode Island, New Hampshire -- we didn’t lose one game. So now we’re faced with this tragic story. Can you talk about what you think the lessons are here? Ligon: You know, that’s a hard question about what the lessons are here. The only thing that I believe --we never know. Every day is a precious day. And the way we looked at it, the man upstairs needed a pitcher and a shortstop. He went from the minor leagues down here to the major league up there. That’s the only way we look at it.